Question: What does Norco have that no other place in the world has? Horses? Nope. Lots of places have horses. But you’re kinda close. The Lake Norconian Club? Well, yes…but this is a food blog. OK, then, Starbucks Coffee? That’s ridiculous. You know there’s a Starbucks on practically every corner in Southern California. Fine. I give up. Sheesh, you give up easily. The thing that Norco has that no other place in the world has…is a Western Bob’s Big Boy statue! And Dine 909 has an exclusive sneak peek after the jump! If you’re a frozen yogurt fan, you should be at the Yogoo la Mode yogurt shop at 7890 Haven Ave., Suite 8 (at Town Center Drive) in Rancho Cucamonga. On Sunday, November 1, they will be celebrating their second anniversary. Free yogurt with toppings (8 oz. max) to the first 100 customers. Buy one, get one free boba tea drinks, yogurt and gelato all day long. 30% discount on all ice cream and yogurt cake orders. VIP club membership (which includes a free ice cream cake during your birthday month, a free small yogurt on your birthday, 15% discount on regular purchases and other special offers) for $25 — a $10 discount. Balloon animals for the kids from noon to 4 p.m.
Yogoo is one of those self-serve yogurt places, similar to Nubi or Ohana, both of which I like. I haven’t yet been to Yogoo, but free frozen yogurt is a difficult thing to pass up. I think I’ll have to pop over and check them out. Special anniversary hours are from 11 a.m. to 10:30 p.m.
(.pdf file) to download their anniversary flier and check out all the deals yourself. I try to attend the Tip-A-Cop fundraisers when I can. The money goes to a good cause — Special Olympics — and I usually bring a friend or two and have a good time. The latest event will take place from 5 to 9 p.m. tonight (October 29) at the Yucca Valley Applebee’s, 57796 Twentynine Palms Highway. Wait a minute! There an Applebee’s in Yucca Valley? The only place I’ve eaten at there is Din Ho Chinese restaurant. Anyway, the California Highway Patrol and San Bernardino County Sheriff’s Department are teaming up with the restaurant for the fundraiser. They’re typically slightly chaotic affairs, but usually lots of fun. Besides, you never know when you might run into one of those officers again in a…let’s say…less honorable moment, and he or she might remember you from the event and let you off with only a warning. Funds raised will be added to $7,000 already collected from similar events and go toward the Morongo Basin Special Olympics. So, do your part and help out. It just might benefit you in the long run. Free chicken! Free chicken! Free chicken! Well, the folks at KFC apparently haven’t had enough bad publicity lately, so today (October 26) they’re attempting to give away free chicken…again. One free piece per customer (duh!). The offer is only available at participating locations (ditto!). The offer applies to grilled chicken only. The free piece is the manager’s choice and may vary by location. You don’t need a coupon, so if you’re willing to wait for a piece of grilled chicken, head on over to your local KFC right now. Me? I had a late lunch over at Ontario Mills, but thanks! marking it’s 68th year since opening its first location in Dallas. You can only get two sandwiches, that’s the limit. 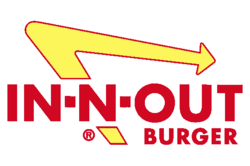 In-N-Out one step closer to opening in Highland? In today’s Sun newspaper, we read Michael Sorba’s story of a developer’s continuing quest to bring an In-N-Out Burger to Highland. One of the stumbling blocks seemed to be a sign near the 210 freeway which the developer wanted to use promote the fast food restaurant and other businesses at the center in which it would be located. However, the center (on Greenspot Road) isn’t directly adjacent to the freeway. The city’s planning commission initially denied the sign request and the developer appealed that decision. Now the developer has withdrawn that appeal and is instead working the developer whose center is next to the freeway to get space on that center’s existing sign. 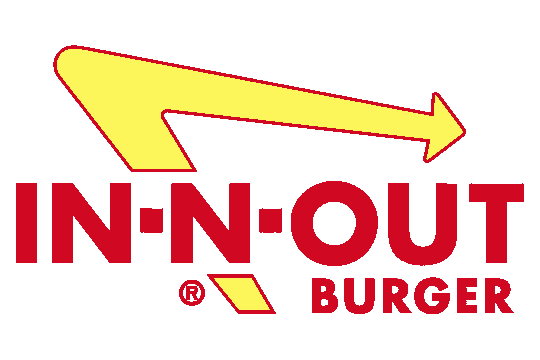 With all the sign-wrangling seeming to be over, it appears that the Highland In-N-Out will soon be a reality. To read Michael’s story, click here. That lonely void left by Sisley’s at Victoria Gardens will soon be filled. Masa Liles, director of marketing for Victoria Gardens. We were willing to forgive you for the red shell on your Volcano taco. It was initially kind of amusing. But this time you’ve gone too far. A black taco shell for your Black Jack taco? It’s not appetizing. Unless you’re a 12-year-old. Or is that your target audience? We have enough artificial food additives entering our bodies without having to worry about god-knows-what is in that burnt-looking taco shell. Did you do any kind of market research beforehand? Did you get responses like “Ew!” or “Ick!” or “Blecch!”? We have just three words for you: Please. Stop. Now. 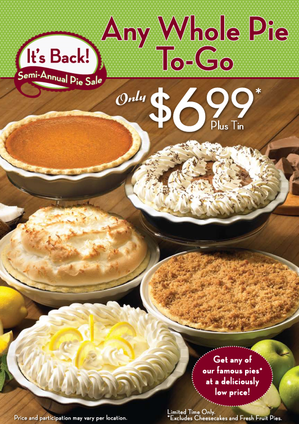 It’s that time of year again…time for Marie Callender’s semi-annual pie sale. That means that their pies, which are normally $10.49 to $15.49, are now just $6.99. My favorite pie ? Probably plain ol’ apple, although I wouldn’t turn away a slice of French apple. Heck, even their sugar-free apple is pretty good! And I think I inherited my taste for pecan pie from my Mom. Of course, pumpkin is perfect for Halloween parties! OK, all this pie talk is making me hungry! As usual, there are restrictions. This time it means that you have to remember to include the cost of the tin, and the deal isn’t good on cheesecakes and fresh fruit pies. It’s only on to-go pies. And price and participation may vary by location. The deal ends October 31. You’ll find lots of Marie Callender’s throughout the Inland Empire: Redlands, San Bernardino, Claremont, Chino, Riverside, Corona, Hemet, Ontario and Temecula. And if you include the deserts for your desserts, there’s Victorville, Rancho Mirage and Palm Desert.